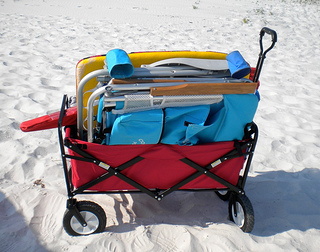 Beach Utility Cart - Get Your Gear To The Beach In One Trip! 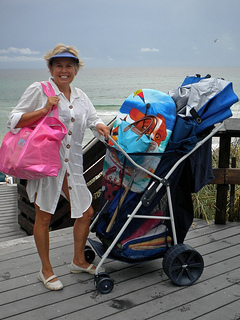 Investing in a beach utility cart has made our trips to and from the beach easier and more organized. 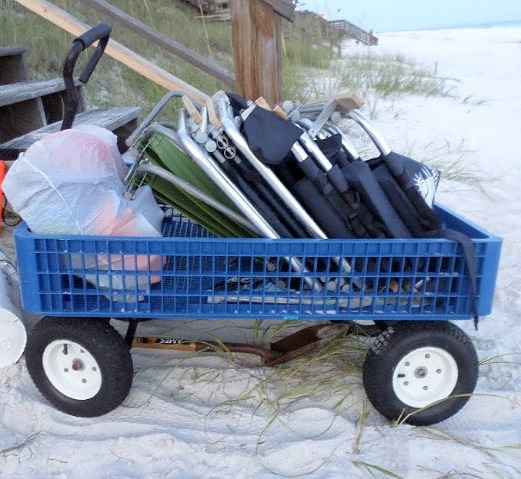 While on our beach vacation all our beach supplies are kept nice and tidy in one centralized spot - the beach wagon. Going to the beach is one of the great pleasures in life. But, all the stuff you have to take with you can be very hard to carry. A beach wagon with all terrain wheels can really be a life saver. And a real back saver, too! 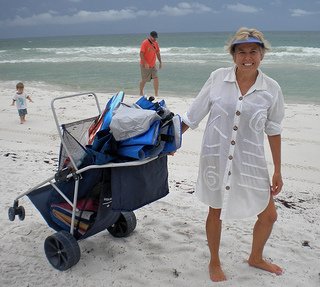 You can easily pack all of your vital beach gear into one cart and haul it to the shoreline in one trip. 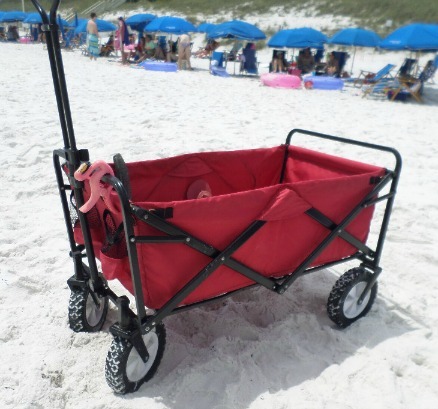 Beach wagons are available in several different styles and sizes that include big wide wheels for easier mobility. This collapsible one folds to only 8" thick so you easily store it in your car when traveling or in a closet at home. The sturdy steel frame means it's ready for some heavy duty use and can hold up to 150 lbs. So whether it's used for hauling beach gear or used for other purposes, there is less carrying and less strain with this beach utility cart. It opens in seconds and has a telescoping handle. Two mesh pockets on the end holds water bottles, sun screen or other smaller items. 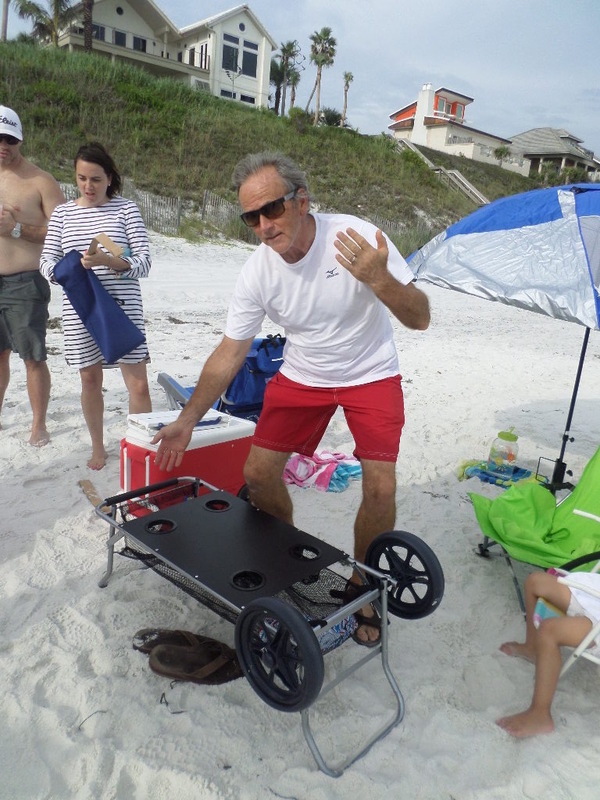 A folding beach cart like the Mac Sports wagon is a favorite for many. It pulls just like a wagon but with fabric sides it is light weight and easy to manuever thanks to it's sturdy wheels that don't rotate. A new and improved collapsible beach wagon by Mac Sports includes large 4"x10" wheels for the sand. A heavy duty steel frame makes it durable - but it still can fold down to only 10" thick. It weighs 24 lbs and is able to hold up to 150 lbs. 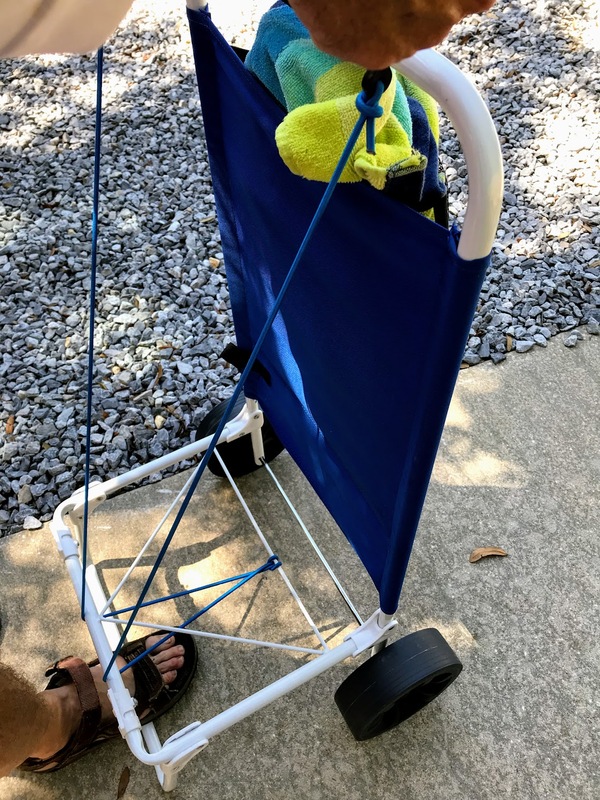 A strong steel frame and 10" pneumatic tires make this rolling beach cart perfect for hauling your beach gear or grandkids with some extra cushions on the bottom. Whichever cart design you choose, buy one that has enough room for all of the things you need to make your day at the beach a truly pleasurable experience. As you can see it is especially helpful for bringing bigger, heavier items like folding chairs and a a pop up tent. You only need to make one trip (that is if you haven't forgotten anything) because everything you need can fit into one of these carts. The spacious main compartment can hold larger items, while the smaller compartments are perfect for smaller items. The tough, yet soft pneumatic tires roll easily over all types of terrain, no matter how heavy or awkward the load may. The sturdy frame is capable of supporting loads up to 100 pounds, and the wide articulating front wheels make it easy to move the cart around. One of the best beach utility carts on the market today is the new model from Wonder Wheeler. The new deluxe model is 20 % larger than the original and features 4” ultra wide rear wheels. With the new Wonder Wheeler you can transport your gear over all types of terrain easier than ever. Whether you are traversing gravel, sand or grass, your beach utility cart will glide as smoothy as if you were hauling on freshly laid asphalt. The generous 10 inch diameter rear wheels, 4 and a half inch pivoting front wheels and super comfortable handle make the deluxe Wonder Wheel super easy to maneuver and a delight to use. The spacious design is capable of holding a 48 quart cooler plus four beach chairs, and supporting up to 100 pounds of weight. 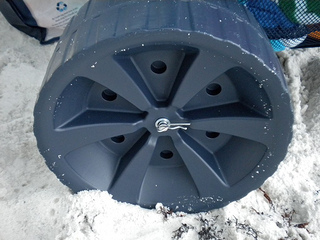 The rear storage compartment measures a generous 14” x 11 ¾” and includes a separate beach umbrella holder. 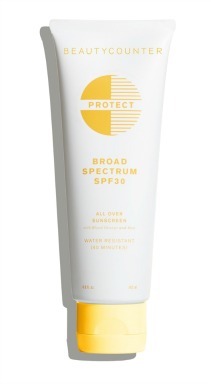 The removable tote is perfect for smaller items such as sunscreen, sunglasses and books or magazines. The Wonder Wheeler is the ideal beach companion. 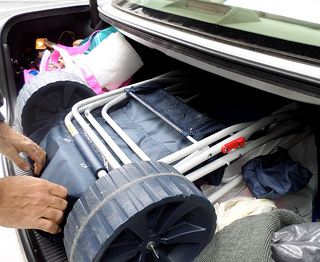 It folds up very compactly and fits into the trunk of a car. 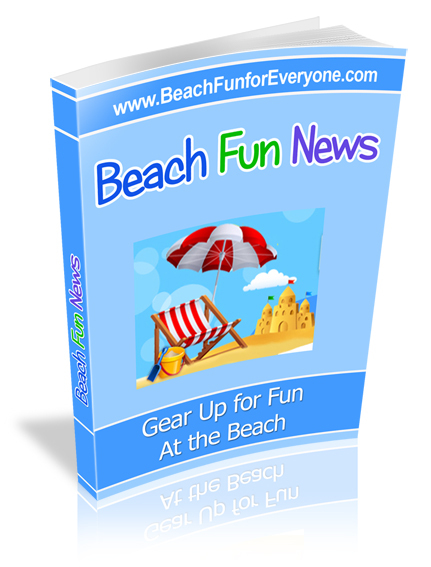 You can load it up and easily transport it to your favorite spot on the beach. 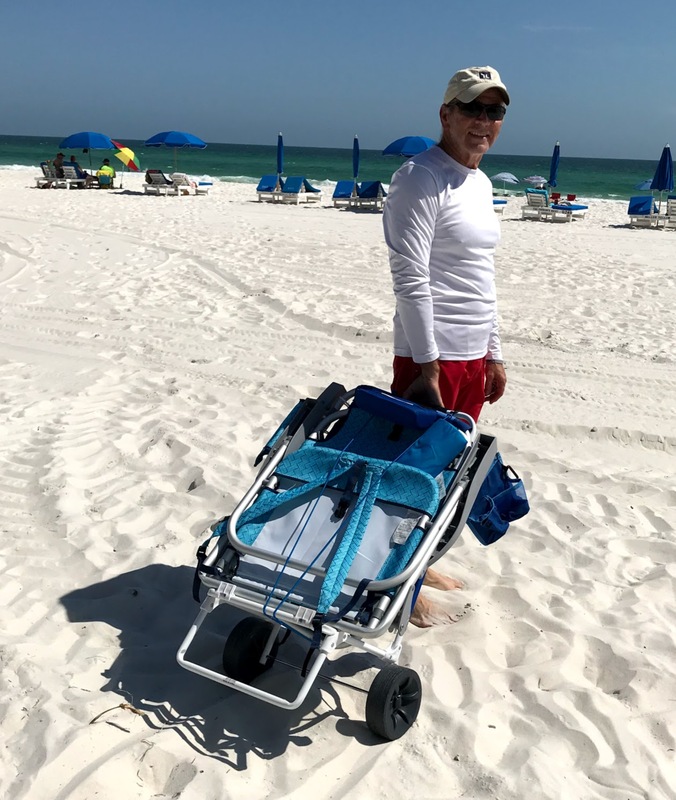 Whether or not your favorite spot will be available is another story, but at least you will have the perfect beach utility cart to lug your stuff to the next available spot. A covered beach wagon helps to transport kids to the beach. A friend of mine told me after a great day at the beach, the walk back to their rented condo became "the trail of tears." The kids were just too tired to make the walk. I told her about this covered beach wagon and she was on it. Unlike a traditional wagon this one handles well in the sand and maneuvers easily thanks to the all terrain tires. The bottom is padded for a comfortable ride and small kids are known to nap in it. The cart folds and collapses so you can easily transport it. 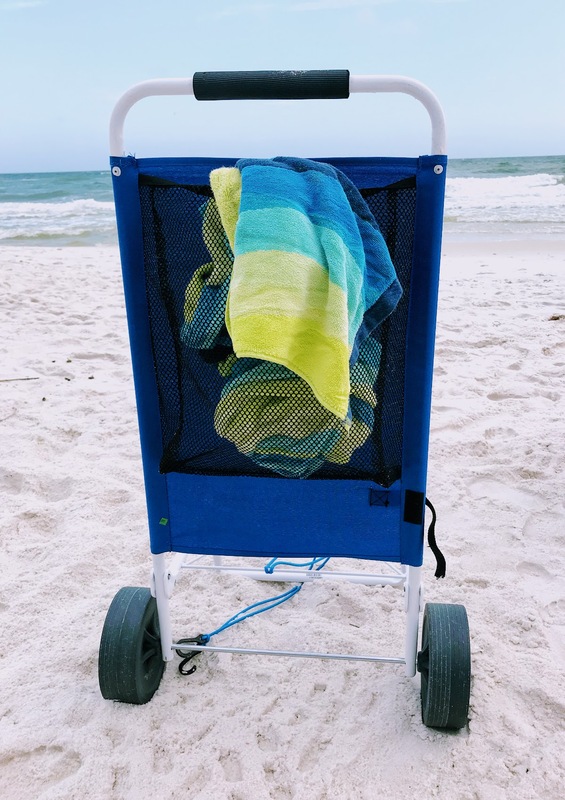 This rolling beach cart by Rio has a large, front mesh pocket for your beach towels and two strong bungee cords to secure your beach chairs. 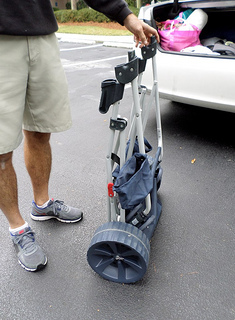 This beach utility cart folds flat making it easy to get into your car or store at home. It's a convenient and easy way to get your gear to the beach. As you can see we brought lots of stuff - beach chairs, bags, towels, and coolers - all in our beach cart that turns into a table. When the weather is really hot, we often head to the beach in the morning and then again late in the afternoon around 4:00 PM. We pack our supper and enjoy the cooler temps, the warm breezes, the smaller crowds and the beautiful sunsets. By simply flipping over the cart it becomes a table. The deep mesh cup holders can be used for drinks, napkins and utensils. This cart came with us every evening. It kept our food and drinks sand free and made it easy to get all of the gear we needed to the beach for pleasant evenings of food and conversation. A great day at the beach would not be complete without all of the little extras you need to play and relax in total comfort. 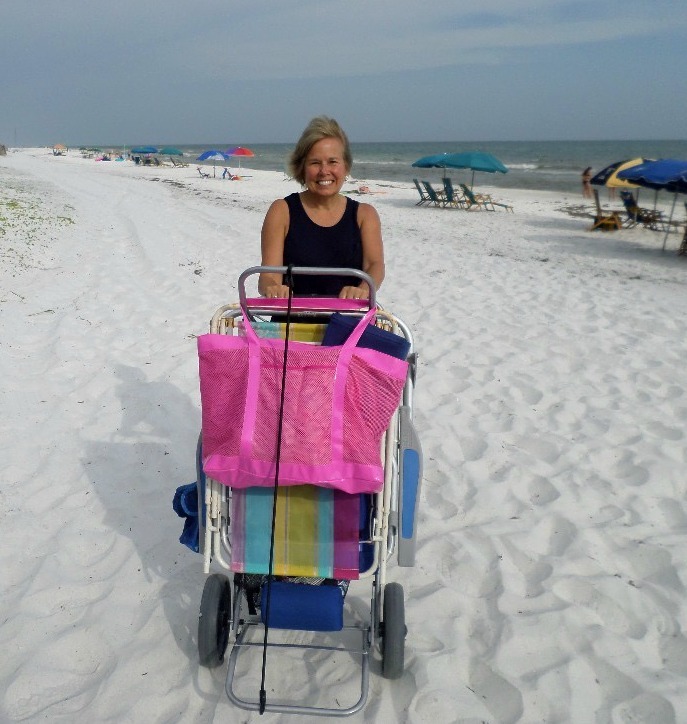 When you pack a beach utility cart with all of the necessities and a few extras to really make the day perfect, you are guaranteed to have a wonderful day.